Amongst the bracelet offerings is a gorgeous array of 'memory wire' bracelet wraps, made from tactile artisan glass and Swarovski crystal beads and pearls. The bracelet coils onto the wrist and quality memory wire means it never loses its shape. Each item is made by hand and the bead arrangements and beads used will vary slightly from piece to piece. Choose either a 2 or a 4 loop bracelet. We can send you photos of the bracelet before you decide to purchase. These items can be made on a smaller coil and in many different colours. 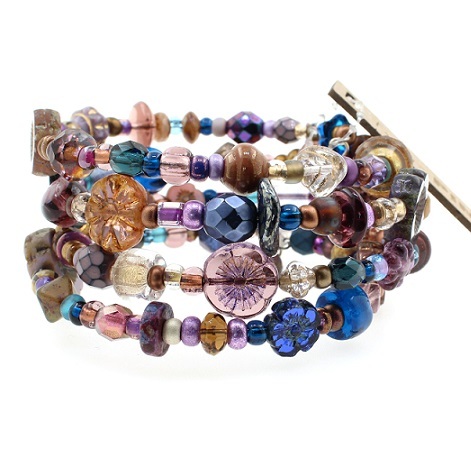 Stunning mix of the finest quality beads, in an opulent and sophisticated palette of zircon blues, teal, amethyst and metallic gold. Contains crystal and glass, such as Czech artisan beads, lots of Picasso glass and Swarovski beads. The beads measure from approx. 3 mm upto 14 mm. Inner diameter 6cm/60mm. Frilly-PINK tag, made in England. A gorgeous mix of metallic bronzes, purple, lilacs, lavender and amethyst shades. The beads measure from approx. 3 mm upto 14 mm. Frilly Pink tag. Made in England. A very pretty white and clear mix of the finest quality glass beads. The beads measure from approx. 3mm upto 14 mm. Frilly-Pink tag. Made in England. Lots of textural Picasso beads in a gorgeous array of blues, green, browns, orange and Earthy tones. The beads measure from approx. 3mm upto 14 mm. Inner diameter 6cm/60mm. Frilly-Pink tag. Made in England. A beautiful mixture of dusty pinks, opal, peach and metallic silvers form this stunning wrap bracelet. The beads measure from approx. 3mm upto 14 mm. A feminine mix of dusty pinks with turquoise blues, all glass and just lovely! The beads measure from approx. 3mm upto 14 mm. A pretty palette of turquoise mixed with navy blues, always using the finest quality beads. The beads measure from approx. 3 mm upto 12 mm. A beautiful combination of teal, petrol and Capri blue, purple and pink, all glass. The beads measure from approx. 3mm upto 12 mm. 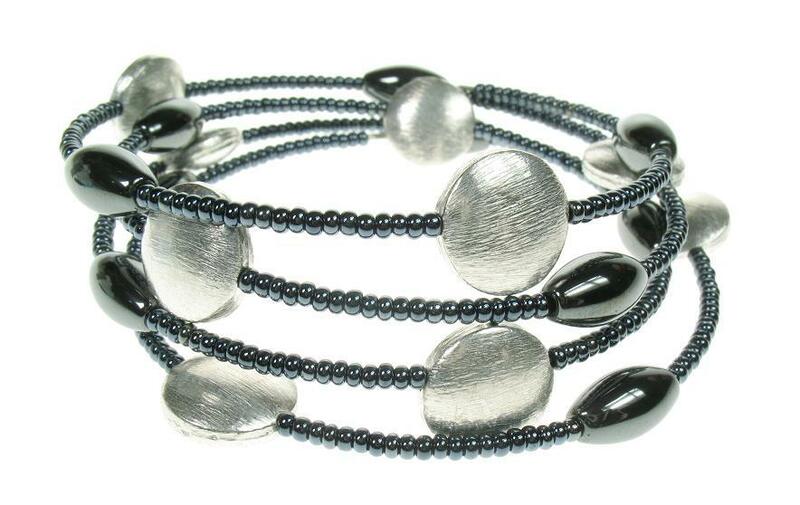 A gorgeous 'memory wire' bracelet wrap. The textured silver flat beads measure 1.2cm/12mm. The bracelet coils onto the wrist and quality memory wire means it never loses its shape. Each item is made by hand and the bead arrangements and beads used will vary slightly from piece to piece. Diameter is 6cm/60mm diameter. Beautiful bracelet formed from smooth square tablets of turquoise (measure 1.8cm/18mm), combined with 2mm seed and 1.4cm/14mm oblong Hematite beads. It is approx. 8 inches/20.5cm in length. Toggle fastener is silver plated. The matching earrings are 6.4cm/64mm in length and the hooks are Hematite black platd.